A hagiography (/ˌhæɡiˈɒɡrəfi/; from Ancient Greek ἅγιος, hagios, meaning 'holy', and -γραφία, -graphia, meaning 'writing') is a biography of a saint or an ecclesiastical leader. The term hagiography may be used to refer to the biography of a saint or highly developed spiritual being in any of the world's spiritual traditions. Christian hagiographies focus on the lives, and notably the miracles, ascribed to men and women canonized by the Roman Catholic church, the Eastern Orthodox Church, the Oriental Orthodox churches, and the Church of the East. Other religious traditions such as Buddhism, Hinduism, Islam, Sikhism and Jainism also create and maintain hagiographical texts (such as the Sikh Janamsakhis) concerning saints, gurus and other individuals believed to be imbued with sacred power. Hagiographic works, especially those of the Middle Ages, can incorporate a record of institutional and local history, and evidence of popular cults, customs, and traditions. However, when referring to modern, non-ecclesiastical works, the term hagiography is often used as a pejorative reference to biographies and histories whose authors are perceived to be uncritical of or reverential to their subject. Hagiography constituted an important literary genre in the early Christian church, providing some informational history along with the more inspirational stories and legends. A hagiographic account of an individual saint can consist of a biography (vita), a description of the saint's deeds or miracles, an account of the saint's martyrdom (passio), or be a combination of these. paterikon ("that of the Fathers"; Greek πατερικόν; in Greek and Latin, pater means "father"), or biography of the specific saints, chosen by the catalog compiler. In Western Europe hagiography was one of the more important vehicles for the study of inspirational history during the Middle Ages. The Golden Legend of Jacob de Voragine compiled a great deal of medieval hagiographic material, with a strong emphasis on miracle tales. Lives were often written to promote the cult of local or national states, and in particular to develop pilgrimages to visit relics. The bronze Gniezno Doors of Gniezno Cathedral in Poland are the only Romanesque doors in Europe to feature the life of a saint. The life of Saint Adalbert of Prague, who is buried in the cathedral, is shown in 18 scenes, probably based on a lost illuminated copy of one of his Lives. Many of the important hagiographical texts composed in medieval England were written in the vernacular dialect Anglo-Norman. With the introduction of Latin literature into England in the 7th and 8th centuries the genre of the life of the saint grew increasingly popular. When one contrasts it to the popular heroic poem, such as Beowulf, one finds that they share certain common features. In Beowulf, the titular character battles against Grendel and his mother, while the saint, such as Athanasius' Anthony (one of the original sources for the hagiographic motif) or the character of Guthlac, battles against figures no less substantial in a spiritual sense. Both genres then focus on the hero-warrior figure, but with the distinction that the saint is of a spiritual sort. Imitation of the life of Christ was then the benchmark against which saints were measured, and imitation of the lives of saints was the benchmark against which the general population measured itself. In Anglo-Saxon and medieval England, hagiography became a literary genre par excellence for the teaching of a largely illiterate audience. Hagiography provided priests and theologians with classical handbooks in a form that allowed them the rhetorical tools necessary to present their faith through the example of the saints' lives. Of all the English hagiographers no one was more prolific nor so aware of the importance of the genre as Abbot Ælfric of Eynsham. His work Lives of the Saints contains set of sermons on saints' days, formerly observed by the English Church. The text comprises two prefaces, one in Latin and one in Old English, and 39 lives beginning on December 25 with the nativity of Christ and ending with three texts to which no saints' days are attached. The text spans the entire year and describes the lives of many saints, both English and continental, and hearkens back to some of the earliest saints of the early church. There are two known instances where saint's lives were adapted into vernacular plays in Britain. These are the Cornish-language works Beunans Meriasek and Beunans Ke, about the lives of Saints Meriasek and Kea, respectively. 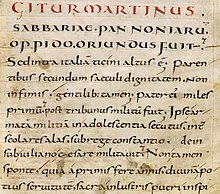 Calendar entries for January 1st and 2nd of the Martyrology of Oengus. 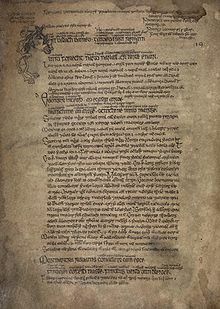 Ireland is notable in its rich hagiographical tradition, and for the large amount of material which was produced during the Middle Ages. Irish hagiographers wrote primarily in Latin while some of the later saint's lives were written in the hagiographer's native vernacular Irish. Of particular note are the lives of St. Patrick, St. Columba (Latin)/Colm (Irish) and St. Brigit/Brigid—Ireland's three patron saints. Additionally, several Irish calendars relating to the feastdays of Christian saints (sometimes called martyrologies or feastologies) contained abbreviated synopses of saint's lives, which were compiled from many different sources. Notable examples include the Martyrology of Tallaght and the Félire Óengusso. Such hagiographical calendars were important in establishing lists of native Irish saints, in imitation of continental calendars. Example of Greek Orthodox visual hagiography. 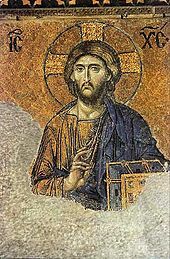 This is one of the best known surviving Byzantine mosaics in Hagia Sophia – Christ Pantocrator flanked by the Virgin Mary and John the Baptist made in the 12th century. In the 10th century, a Byzantine monk Simeon Metaphrastes was the first one to change the genre of lives of the saints into something different, giving it a moralizing and panegyrical character. His catalog of lives of the saints became the standard for all of the Western and Eastern hagiographers, who would create relative biographies and images of the ideal saints by gradually departing from the real facts of their lives. Over the years, the genre of lives of the saints had absorbed a number of narrative plots and poetic images (often, of pre-Christian origin, such as dragon fighting etc. ), mediaeval parables, short stories and anecdotes. The genre of lives of the saints was introduced in the Slavic world in the Bulgarian Empire in the late 9th and early 10th century, where the first original hagiographies were produced on Cyril and Methodius, Clement of Ohrid and Naum of Preslav. Eventually the Bulgarians brought this genre to Kievan Rus' together with writing and also in translations from the Greek language. In the 11th century, the Rus' began to compile the original life stories of the first Rus'ian saints, e.g. Boris and Gleb, Theodosius Pechersky etc. In the 16th century, Metropolitan Macarius expanded the list of the Rus'ian saints and supervised the compiling process of their life stories. They would all be compiled in the so-called Velikiye chet'yi-minei catalog (Великие Четьи-Минеи, or Great Menaion Reader), consisting of 12 volumes in accordance with each month of the year. They were revised and expanded by St. Dimitry of Rostov in 1684–1705. Today, the works in the genre of lives of the saints represent a valuable historical source and reflection of different social ideas, world outlook and aesthetic concepts of the past. Traditional Ethiopian Orthodox Tewahedo Church hagiography in Ge'ez language is known as the Gadl (Saint's Life). They are, in addition of the Axumite inscriptions and the Ethiopian Royal Chronicles, among the most important Medieval Ethiopian written sources. However, their historical accuracy is in question. They were created by the disciples of the saints. Some were written a long time after the death of a saint, but others were written not long after the saint's demise. Hagiography in Islam began in the Arabic language with biographical writing about the Prophet Muhammad in the 8th century CE, a tradition known as sīra. From about the 10th century CE, a genre generally known as manāqib also emerged, which comprised biographies of the imams (madhāhib) who founded different schools of Islamic thought (madhhab) about shariʿa, and of Ṣūfī saints. Over time, hagiography about Ṣūfīs and their miracles came to predominate in the genre of manāqib. Likewise influenced by early Islamic research into hadiths and other biographical information about the Prophet, Persian scholars began writing Persian hagiography, again mainly of Sūfī saints, in the eleventh century CE. The Islamicisation of the Turkish regions led to the development of Turkish biographies of saints, beginning in the 13th century CE and gaining pace around the 16th. Production remained dynamic and kept pace with scholarly developments in historical biographical writing until 1925, when Mustafa Kemal Atatürk (d. 1938) placed an interdiction on Ṣūfī brotherhoods. As Turkey relaxed legal restrictions on Islamic practice in the 1950s and the 1980s, Ṣūfīs returned to publishing hagiography, a trend with continues in the 21st century. ^ Ælfric of Eynsham. The Lives of the Saints. Retrieved 1 December 2018. ^ Koch, John T. (2006). Celtic Culture: A Historical Encyclopedia. ABC-CLIO. pp. 203–205. ISBN 1-85109-440-7. Retrieved November 23, 2009. ^ G. Hickes, Dissertatio Epistolaris in Linguarum veterum septentrionalium thesaurus grammatico-criticus et archeologicus (Oxford 1703–05), p. 115. ^ John Leland, The Collectanea of British affairs, Volume 2. p. 408. ^ Liuzza, R. M. (2006). "The Year's Work in Old English Studies" (PDF). Old English News Letter. Medieval Institute, Western Michigan University. 39 (2): 8. ^ "Lives of Ethiopian Saints". Link Ethiopia. Archived from the original on 5 March 2017. Retrieved 4 March 2017. ^ Ch. Pellat, "Manāḳib", in Encyclopaedia of Islam, ed. by P. Bearman, Th. Bianquis, C.E. Bosworth, E. van Donzel, and W.P. Heinrichs, 2nd edn, 12 vols (Leiden: Brill, 1960–2005), doi:10.1163/1573-3912_islam_COM_0660. ^ Alexandre Papas, “Hagiography, Persian and Turkish”, in Encyclopaedia of Islam, THREE, ed. by Kate Fleet, Gudrun Krämer, Denis Matringe, John Nawas, and Everett Rowson (Leiden: Brill, 2007–), doi:10.1163/1573-3912_ei3_COM_23914. Heffernan, Thomas J. Sacred Biography: Saints and Their Biographers in the Middle Ages. Oxford, 1992. Mariković, Ana and Vedriš, Trpimir eds. Identity and alterity in Hagiography and the Cult of Saints (Bibliotheca Hagiotheca, Series Colloquia 1). Zagreb: Hagiotheca, 2010. Vauchez, André, La sainteté en Occident aux derniers siècles du Moyen Âge (1198–1431) (BEFAR, 241). Rome, 1981. [Engl. transl. : Sainthood in the Later Middle Ages. Cambridge, 1987; Ital. transl. : La santità nel Medioevo. Bologna, 1989]. Look up hagiography in Wiktionary, the free dictionary. Wikimedia Commons has media related to Hagiography. Herbermann, Charles, ed. (1913). "Hagiography" . Catholic Encyclopedia. New York: Robert Appleton Company.